JIHAD TAXI DRIVER IN COURT……. – The Tundra Tabloids……. JIHAD TAXI DRIVER IN COURT……. Throw the book at this terrorist. Majid Rehman, of North Clive Street, Grangetown, Cardiff, was charged with inflicting grievous bodily harm with intent on Mark Anthony Underwood, and seven counts of attempting to inflict grievous bodily harm on seven other pedestrians. Appearing before Cardiff Magistrates’ Court, the 28-year-old entered no plea for the offences. 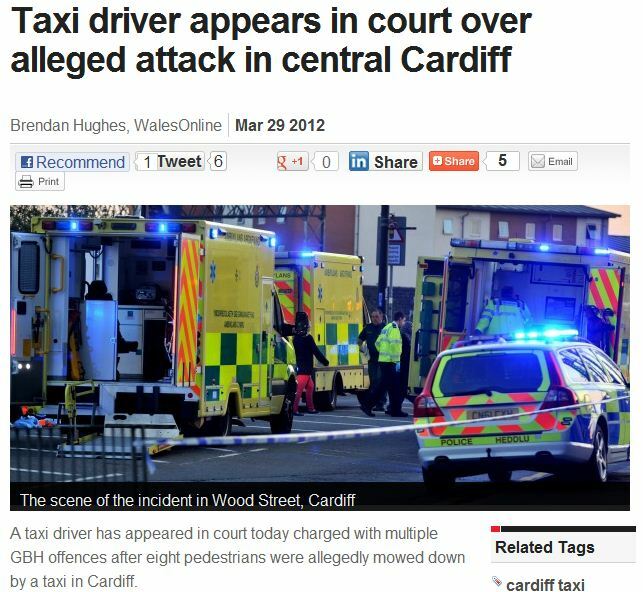 The court heard of an incident on Tuesday at about 7pm, in which eight pedestrians were injured by a taxi driving on Wood Street, near the Millennium Stadium. Previous Post Previous Post VIOLENCE RHETORIC BEING RATCHETED UP IN WAKE OF TRAYVON MARTIN SHOOTING……. No Mohammed coefficient here but the name ‘Majid’ is very popular in Iran amongst other places and means “All glorious”, Al Majid being one of the names of god in the Quran. Majid may also be a diminutive of ‘Abdulmajid’ which means ‘ Slave of God’ (a.k.a Allah). This particular Majid’s antecedents, if ever they are exposed to the light of day, could be interesting.